If you are concerned about health – yours and the planet’s – then eating less meat is one of the best things you can do. 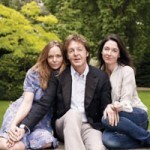 Now the world’s most famous veggie Sir Paul McCartney – along with his daughters Stella and Mary – have made cooking and eating with vegetables and wholefoods a real pleasure with their Meat Free Monday Cookbook (Kyle Books, £19.99). The book contains some of the family’s favourite vegetarian recipes including Sir Paul’s own Refried Bean Tacos and Super Vegetable Salad. A few famous friends, including renowned chefs Yotam Ottolenghi, Anna Hansen, José Pizarro and Giorgio Locatelli, and celebrity friends such as Twiggy, Woody Harrelson, Pink, Vivienne Westwood and Kevin Spacey have also contributed their top recipes. This beautifully illustrated book has a range of exciting starters, mains and deserts to help you go deliciously meat-free once (or even twice) a week. 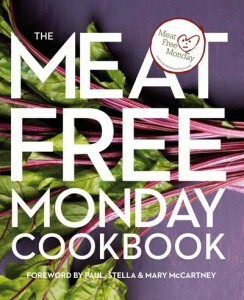 Royalties from the book will go directly to support the work done by the McCartney’s Meat Free Monday campaign. We are thrilled to have 5 fabulous copies to give away (see details below). And even if you don’t win, you can check out this recipe for Spiced Wholewheat Couscous with Sweet Potato and Pistachios by Stella McCartney – just to whet your appetite! Lowering our consumption of meat has never been more urgent. Studies show that people who eat plant-based diet tend to have lower risk of developing heart disease, diabetes and certain cancers. They may also find managing their weight easier. Low-meat or meat-free diets are also healthier for the planet. Intensive livestock production is carbon, water and energy intensive – and highly polluting. Globally the livestock industry is responsible for around one fifth of all greenhouse gas emissions. A recent report showed that the UK could cut the carbon emissions significantly if the population went meat-free or vegan. Researchers calculated the carbon footprint of 61 foodstuffs and confirmed what has long been known: that meat and cheese has the worst carbon footprint across the board. Adopting a vegetarian or vegan diet, said the researchers, would result in a 22-26% cut in the 167 million tons of greenhouse gases associated with UK food and would have the same environmental benefit as talking half of all cars off the road. According to Sir Paul, going meat free one day a week also has economic advantages. “In difficult economic times, people discovered that have at least one meat-free day in their week helped their family budget,” he says.